A bipartisan bill introduced in the U.S. Senate last week would create a wildfire funding account, reducing the need to take money from other programs when it’s needed in emergencies to fight big wildfires. 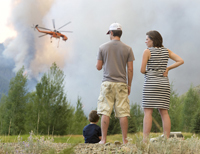 The Wildfire Disaster Funding Act of 2013 was introduced by Sen. Mike Crapo, R-Idaho, and Sen. Ron Wyden, D-Ore., chair of the Energy and Natural Resources Committee. According to a statement on Crapo’s website, agencies now base wildland fire suppression budgets on the average costs of the past 10 years, which has underestimated the actual costs during eight of the past 10 years, forcing the Forest Service and Interior Department to take money from other programs to make up the difference. This measure would move any fire suppression spending above 70 percent of the 10-year average to a disaster funding account separate from Forest Service and Interior budgets. The Interior Department and the Forest Service estimate 1 percent of fires consume 30 percent of firefighting budgets, and thus should be treated as natural disasters. Crapo said removing those megafires from the regular budget could free up to $412 million for land management agencies to fund fire-prevention and hazardous-fuels-reduction projects that can help break the cycle of increasingly dangerous and costly fires. A coalition of 12 conservation, timber, tribal, recreation, sportsmen and employer groups praised Wyden and Crapo for introducing the bill. In a news release, the organizations stated that since 2000, federal agencies have run out of money to fight emergency fires eight times. They pointed out that many factors contribute to the increase in wildfire frequency and severity, including changes in climate, buildup of hazardous fuels and increasing populations in the wildland-urban interface. The groups stated that during the past decade, fires have burned 57 percent more land than in the previous four decades. They said that since the 1970s, the fire season has expanded by two months and the average size of fires has increased by a factor of five. They contended that the frequency and severity of those wildfires need to be matched by significant levels of funding to protect people, water and wildlife.